The current production and processing has been improving the quality and effect of the production, and the accessories such as Spherical Plain Bearing GE.FO Series also have a good improvement effect, and even the accuracy is better than some traditional instruments. The range also provides better results. The current production and processing has been improving the quality and effect of the production, and the accessories such as Spherical Plain Bearing GE.FO Series also have a good improvement effect, and even the accuracy is better than some traditional instruments. The range also provides better results. By reforming production, we ensure the performance of the joint bearings and ensure the quality of the supply. Spherical Plain Bearing The GE.FO Series consists mainly of a plain bearing with an outer spherical inner ring and a special outer ring with an inner spherical surface. 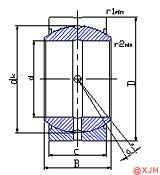 Due to the characteristics of the joint bearing, the bearing load of the joint bearing is very large. It not only has to withstand radial and axial loads, it also has to withstand combined loads.